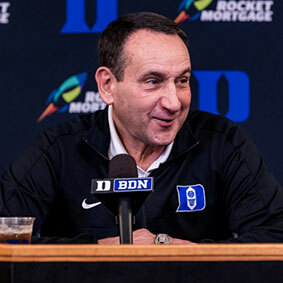 NEW YORK – Mike Krzyzewski, the Hall of Fame head coach of the Duke University Blue Devils, will host the premiere episode of the 14th season of his weekly SiriusXM show, Basketball and Beyond with Coach K, on Thursday, October 25 (6:00 pm ET). After this week’s debut and throughout the season, a new edition of Basketball and Beyond will air every Thursday (6:00 pm ET) on ESPNU Radio on SiriusXM (channel 84), which is available nationwide on SiriusXM radios, on the SiriusXM app and on connected devices including smart TVs, Amazon Alexa devices, Sony PlayStation and Roku. Episodes are also available to subscribers through SiriusXM On Demand. Basketball and Beyond is entering its 14th season on SiriusXM and features Coach K and co-host Dave Sims interviewing successful people from many different walks of life, including sports, pop culture, politics and more. Some of the high profile guests who have joined Krzyzewski on the program in recent seasons include Los Angeles Angels outfielder Mike Trout, Alabama Crimson Tide head football coach Nick Saban, Philadelphia Eagles head coach Doug Pederson, Las Vegas Golden Knights Owner Bill Foley, celebrity chef Bobby Flay, Hall of Fame quarterback Brett Favre, NASCAR driver Dale Earnhardt Jr., New England Patriots head coach Bill Belichick, NBA Commissioner Adam Silver, General Martin Dempsey, actor Rob Lowe, University of North Carolina head basketball coach Roy Williams and many others. Throughout more than four decades as a head basketball coach, 38 years at Duke University, Coach K has built one of the greatest coaching resumes in sports history. A member of the Naismith Basketball Hall of Fame since 2001, he is the all-time winningest head coach in NCAA Men’s Division I basketball history with 1100 victories, and he led Duke to its fifth NCAA Championship title in 2015. As the head coach of the USA Basketball Men’s National Team, Coach K won three Olympic gold medals, two FIBA World Championship gold medals and one FIBA Americas Championship gold medal. In addition to Coach K’s program, SiriusXM carries live play-by-play coverage of Duke basketball games throughout the season. SiriusXM offers play by play from the ACC, Big Ten, Big 12, Big East, Pac 12, SEC, American Athletic Conference and other NCAA Division I conferences. For more information visit SiriusXM.com/ESPNUonSXM.